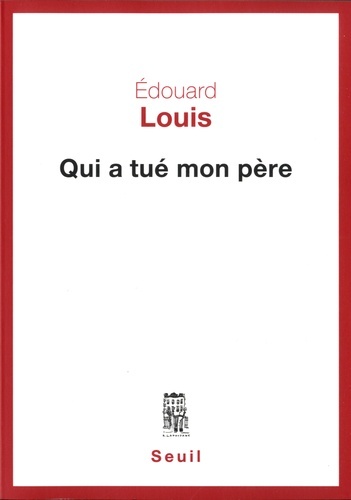 Who Killed My Father by Edouard Louis (2018) Original French title: Qui a tué mon père. Ta vie prouve que nous ne sommes pas ce que nous faisons, mais qu’au contraire nous sommes ce que nous n’avons pas fait, parce que le monde ou la société, nous en a empêchés. Parce que ce que Didier Eribon appelle des verdicts se sont abattus sur nous, gay, trans, femme, noir, pauvre, et qu’ils nous ont rendu certaines vies, certaines expériences, certains rêves, inacessibles. Your life proves that we are not what we do but in the contrary, we are what we haven’t done because the world or society was in the way. Because what Didier Eribon calls sentences have descended upon us, gays, trans, women, black or poor and these sentences have made some lives, some experiences or some dreams unreachable to us. Who Killed My Father is a short non-fiction book by Edouard Louis, the young author of The End of Eddy. It was published on May 3rd, 2018, the exact date is relevant. Edouard Louis is also a graduate of EHESS, the School for Advanced Studies in the Social Sciences. Sociology is his territory. In Who Killed My Father, he comes back to his complicated relationship with his father and his social background. We understand that his father had to stop working because of a work-related accident, that his back is wrecked and that his life has been even tougher than what is described in The End of Eddy. This short non-fiction opus is a description of the social violence done to his father and by extension, to a large part of the working class. He describes the impact of public decisions on social benefits from his father’s perspective. Through snippets of life, we see what political decisions make on the life of a man broken by hard working conditions. He gives specific examples, gives the names of the politicians who promoted a particular measure and throws them back what this or that decision entailed for the recipients of social benefits or for poor workers. This is his father. He’s a representative of an important part of the population whose life conditions are degraded after liberal capitalism won the economic sphere and politics became a synonym of managing short-term finances. Describing how his father was forced to take a job that was not compatible with his health condition, he rocks the boat of the generally admitted law that any job is better than no job. It becomes an excuse to accept with jobs with appalling working conditions. At the Davos summit, Winnie Byanyima, an Oxfam executive director mentioned her meeting with poultry workers in the US who had to wear nappies because they had no toilet breaks. I didn’t ven know it was legal. Shocking, right? But not surprising when you’ve read A Working Stiff’s Manifesto by Iain Levison. Publication date: May 2018. Beginning of the Yellow Vests movement: November 2018. Genuine participants to this movement: people like Edouard Louis’s father. I read Who Killed My Father before the movement started. It stayed with me because it hit me right in the face. Edouard Louis sometimes irritates me, and certainly, he’s got his own issues. But I think it’s good for the country to have thinkers who come from the working class and who understand things that are oblivious to the ruling bourgeoisie because this reality is simply not part of their quotidian. I wondered what Edouard Louis thought of the Yellow Vests movement and I found a great article here at The Inrocks.